The architecture of a staircase can vary entirely from simple to complex. However, no matter how difficult or simple the design, the staircase architecture must be built to code for safety purposes. That’s where Southern Staircase comes in! Hiring a specialized staircase builder allows you, the client, to collaborate with a team of architects and specialized stair builders that can easily create the staircase that’s perfect for your space. Whether you are located in Seattle, Washington, or New York, New York, Southern Staircase’s streamlined stair building process can take care of your project, every step of the way! With our collaborative staircase design approach, to staircase building, and even to staircase delivery and complete installation, all services are available to you no matter your location. 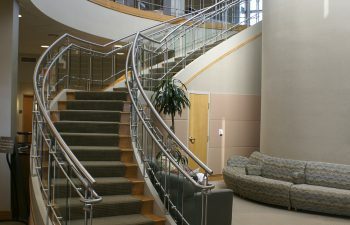 Are you looking for a commercial staircase? Building a home with a complex double curved stair in the design? Southern Staircase can help. Our team works with home builders, architects, home owners, and even commercial builders work with our team to produce that special design they need to complete their project.